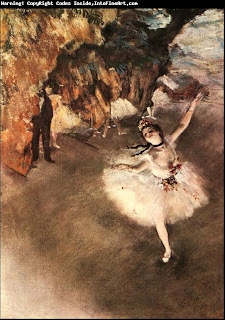 Edgar Degas is most famously known for his paintings of ballerinas. "Dancer on Stage" is a beautiful painting of a ballerina up front in the center. She is the main focus in this painting, while the other objects and dancers are in the background. Most of the works by Degas portray labor, which is why I like this piece. It is quite difficult to see where all of the labor is in it. The only hint of labor is probably in the back where the other ballerinas are gathered, while practicing or waiting to perform. However, the dancers in the background are very blurry and not in focus. It is almost as if Degas does not want to show labor. The main dancer in this portrait is shown as beautiful and glowing. She is very pale and her dress radiates, which gives the girl a very light and graceful feeling. The brushstrokes of the floor have a very smooth pattern that blend in with her dress. This gives the sense of movement and adds onto the gracefulness. In this painting Degas does a good job at covering up the harshness of child labor.